Can you believe that summer vacation is almost over and soon children everywhere will be starting a new school year? 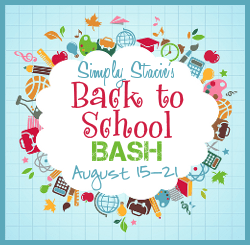 Simply Stacie is delighted to announce that we will be hosting our annual “Back to School Bash”. This is an event created to introduce and link our readers to resources that will make it easier than ever to purchase everything necessary for their kids to head back to school in style. The event will take place August 15 to 21st. We would love to include you in our line-up with a showcase review (always free of charge) and/or giveaway! Please contact me at simplystacieblog at gmail dot com for more information or to secure your spot.